Wilhelmina Barns-Graham CBE (1912-2004) was a pioneer of post-war British abstraction, known for her boldly colourful and painterly imagery. In 2018, Gallagher & Turner will show beautiful examples of etching and lithography made in the 1990s, alongside exuberant late screenprints with which the artist, in her own words, really ‘let rip’. 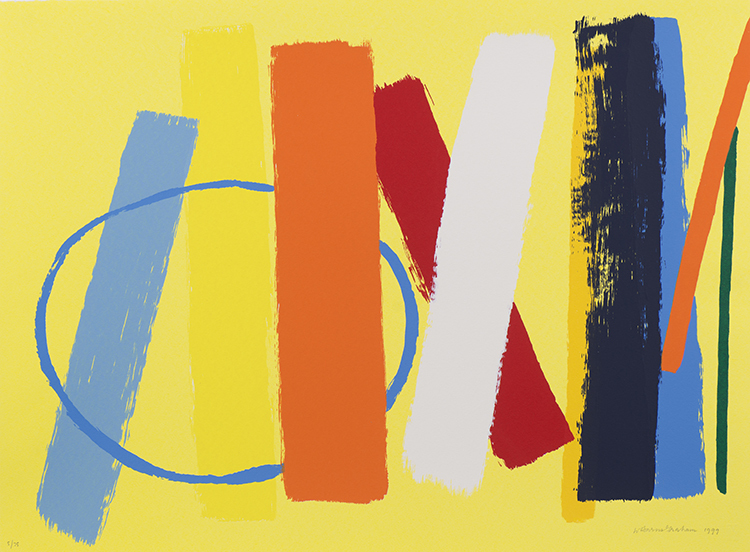 At the forefront of Britain’s abstract art movement, Barns-Graham is associated with the School of St. Ives artists since taking refuge there in 1940 after studying in Edinburgh, forging relationships with Ben Nicholson, Barbara Hepworth and Naum Gabo. Later, whilst in her eighties, Barns-Graham produced an astonishing number of brilliant paintings and prints between her Cornish studio and hometown of St. Andrews. Although Barns-Graham had made the occasional etching and linocut, it was screenprints made at Curwen Studio in 1991 that can be seen as the true start of her life as a printmaker. Her introduction to Carol Robertson and Robert Adam of Graal Press in 1998 provided her with a more expansive range of possibilities due to Robertson’s groundbreaking development of water-based screenprinting inks. With Barns-Graham’s individual brush marks captured on acetate, they made prints that are truly an embodiment of the artist’s expressive, painterly style. Her ‘Time’ series was so successful that she went on to collaborate with Graal on the creation of significant series of images - Millennium, Sunghrie, and Earth - concluding with the White Circle, Wind Dance and Water Dance (Porthmeor) series of 2002/3. For Barns-Graham, printmaking was a liberating experience, one in which she could play with screens to create complete series of images. Bold new ideas sprang constantly from these variations. She worked so prolifically, outpacing the printers with whom she collaborated, that several editions were unsigned or unprinted at the time of her death in 2004. These latter prints, all strictly mapped by the artist, were editioned posthumously to ensure a complete catalogue of the stunning work that Barns-Graham created. Wilhelmina Barns-Graham was one of Britain’s most significant 20th century modern artists. Scottish born and a prominent member of the St Ives group, she was a sublime draftsman, painter, printmaker and a brilliant colourist. Dividing her time between studios in St Ives and St Andrews she followed a consistent artistic vision throughout her sixty-five-year career. Her work is held in all major UK public collections.